National Geographic Encounter: Ocean Odyssey, an immersive entertainment experience that transports you underwater to the oceans from the South Pacific to the coast of California, is coming to the Middle East. Sealing a partnership with HRH Prince Khaled bin Alwaleed's KBW Ventures and the General Entertainment Authority of Saudi Arabia, Ocean Odyssey is all set to launch up to 10 new locations in Saudi Arabia, with the first of such experiences to be situated in the city of Riyadh starting in 2019. 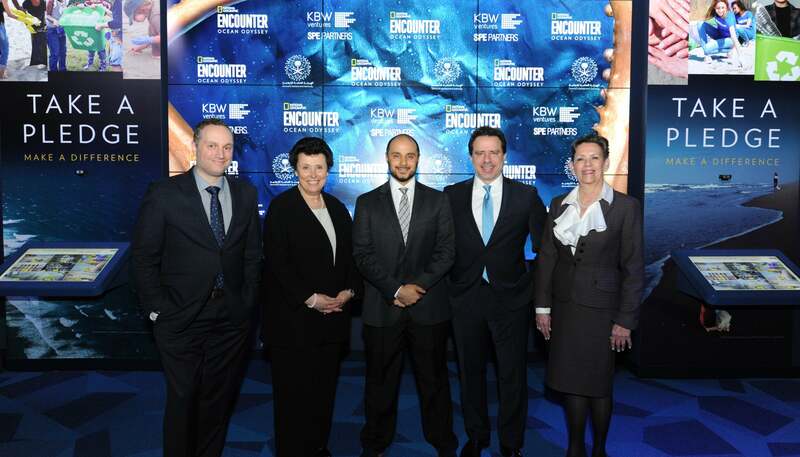 (L to R): Alexander Svezia, SPE Partners; Rosa Zeegers, National Geographic Partners; Prince Khaled bin Alwaleed, KBW Ventures; William Pennell, SPE Partners; Christine Kurtz, SPE Partners. Image credit: Diane Bondareff/AP Images. Created with the inputs of technologists and scientists, National Geographic Encounter says it is working with marine biologist, professor and National Geographic Emerging Explorer David Gruber to bring the underwater experience to the Middle East. Ocean Odyssey also helps support the National Geographic Society’s key exploration and conservative works around the globe, including the Pristine Seas Project. Visitors to the show get an opportunity to get up close with species including sea lions, sharks, a 50-foot Humpback whale, and others. The experience also includes an Exploration Hall session featuring tales from National Geographic photographers and explorers including Sylvia Earle, Bob Ballard and Enric Sala.